Be the first to share your favorite memory, photo or story of Rudolf. This memorial page is dedicated for family, friends and future generations to celebrate the life of their loved one. Rudolf Huber, 80, of Tannersville passed away on Sunday February 3, 2019 at the Lehigh Valley Hospital Cedar Crest after a skiing accident on Camelback Mountain. He was the husband of Anna L. Speck, they were married June 22, 1963. Born February 2, 1939 in Hieflau, Austria, the son of the late Adolf and Veronika (Luser) Huber. Rudolf emigrated from Austria to the United States in 1960. He was a resident of Monroe County since 1988 and prior to that of Kenilworth, New Jersey. Rudolf was a member of Our Lady of Victory Catholic Church in Tannersville. While in Austria he worked as an electrician, and when he moved to New Jersey he worked for Heraeus Amersil for over 28 years. When he moved to the Poconos’ in 1988 when he bought the Village Store on Sullivan Trail on the way to Camelback Mountain and ran it until 2004. 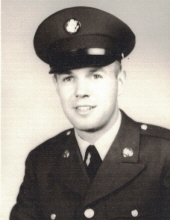 Rudolf was Veteran of both the Army of Austria while living in Austria and then joined the United States Army during the Vietnam War from 1963 until 1966. He was an avid and lifelong skier and was a fixture on Camelback Mountain and also skied for the United States Army as well as played soccer for the United States Army Team. In addition to his wife, Anna, Rudolf is survived by his son Rudolf W. Huber and his wife Kelly of Bethlehem; his 3 grandchildren Taylor, Benjamin and Connor Huber all of Bethlehem. He is also survived by his sister Herta Slavec and her husband Joseph of Austria; and many nieces and nephews in Austria. He was predeceased by his 2 brothers Alfred and Adolf and his sister Erna. A Memorial Mass will be celebrated on Saturday March 2, 2019 at 11:00am at Our Lady of Victory Catholic Church, 327 Cherry Lane Road Tannersville with Father Richard E. Czachor as celebrant. There will be a visitation from 10:30am until the time of Mass at Church. The Bensing-Thomas Funeral Home, 401 North 5th Street, Stroudsburg is in charge of the funeral arrangements. To plant a tree in memory of Rudolf Huber, please visit our Tribute Store. "Email Address" would like to share the life celebration of Rudolf Huber. Click on the "link" to go to share a favorite memory or leave a condolence message for the family.